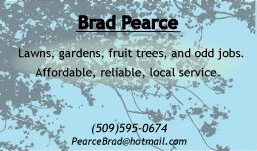 I’m available for hire in the Palouse area! If your yard or garden is overgrown and you don’t have the time or energy to get it under control, you deserve local and passionate services to get the beautiful lawn and garden of your dreams! I’ve done yard care since I was a kid and have years of experience and can do all sorts of different things. Most of what I do is weeding, pruning decorative hedges, lawnmowing, hacking back overgrown areas, pruning fruit trees, and various odd jobs when someone just needs a freelancer. The website is still under construction but it will be used to showcase my work and other interests. Using a contact form has been a persistent problem. Please contact me directly! Here are some pictures from recent jobs- sorry, I don’t take very good pictures and often forget to take proper before and after pictures! This is another very overgrown job I was happy with. Unfortunately, I forgot to take pictures of the front of the house, which showed the biggest improvement! I love to make things into square shapes that match the human-made lines of structures and walkways. These are showing a lot of brown now, but it is necessary to get them back into shape. And look how much it opened the front of the building! Here I cleared back majorly overgrown hedgerow of cotoneaster to open up the paths around a client’s house- it opened up her courtyard so much! One of my favorite things is pruning fruit trees in the winter! Here are some fruit trees I pruned last winter – I can’t take credit for the cool shape, I just took pruning the tree over a year before. More information about my apple tree’s awesome year is available here! I’m also available to build raised beds and do other odd jobs. This is a raised bed I moved for someone. I had to be creative about changing the shape and making sure it got the best light possible. I’m really happy with how it turned out, particularly the symmetry of the bed with the sidewalk! I’ll be updating this page with new jobs as time goes on, I hope to hear from you!